BackType, one of the better conversation tracking tools we’ve come across so far, is releasing a couple of new features today that arguably make it a top gun in the space. The startup, launched in August 2008 on $15k thanks to Y Combinator’s summer program, has also closed a round of seed funding to the tune of $300,000 from True Ventures, led by the firm’s founder and partner Toni Schneider, notably also the CEO of Automattic (the company behind blogging powerhouse WordPress). 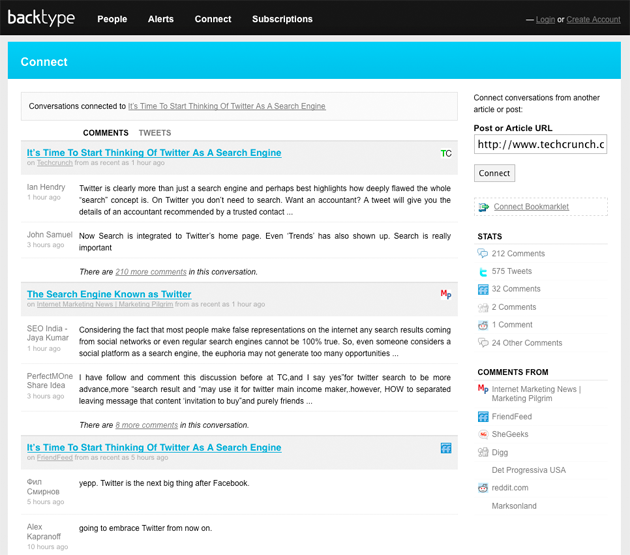 BackType, unlike commenting enablers like Disqus, JS-Kit, IntenseDebate and coComment, offers a one-stop destination for retrieving comments on just about any topic across a wide variety of blogging platforms and social services (Twitter, FriendFeed, etc.). You can do a simple keyword search but also track people specifically, e.g. Michael Arrington. Evidently, you can subscribe to search query results by RSS feed and e-mail (based on a keyword or only for an article you indicate). 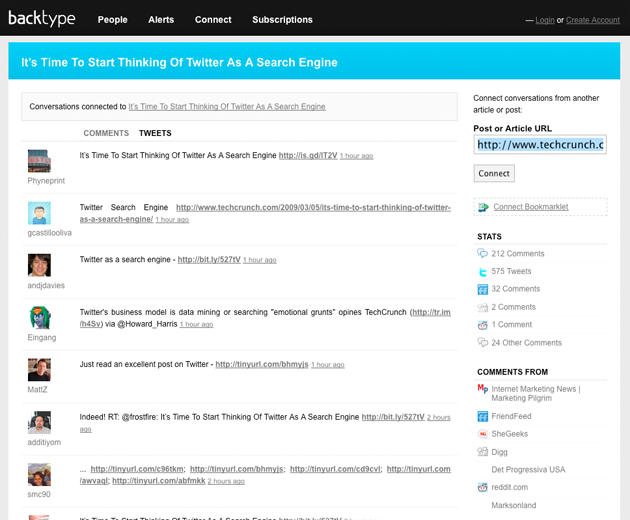 You can also feature your own comments across the web on your own blog using a widget. Today the company is introducing a new feature dubbed BackType Connect, soon to be included in their API, which makes it even easier to follow conversations centered around a certain blog post or article. All you need to do is go to the website and enter the URL of the post, and BackType will fetch all the conversations around it and display the gist on one page, along with some stats. As you can see in the second screenshot, there’s also a dedicated tab for ‘tweets’ i.e. Twitter messages, which comes in handy with Twitter now being a real-time search engine and all that. But it doesn’t stop there. BackType is today also launching BackTweets, a separate website where you can track conversations that are going around on the micro-sharing service, based on keywords or URLs (even when they are shortened!). For an example, check a search for ‘beta.techcrunch.com’. They also created a special page tracking the top links on Twitter, which can be somewhat compared to the functionality of Techmeme (or Tweetmeme, of course). UberVU (our coverage) and Artiklz (our coverage) offer similar services, although in terms of quality of returned results BackType wins the race, at least for the couple of keywords and websites addresses we tested. In this day and age, it’s essential for individuals, companies and brands to track conversations on the Internet, and BackType makes for an excellent service for weeding through comments on the social web, which can often prove invaluable. The startup still offers the basic functionality for free and is currently still figuring out how to make money from enabling companies and publishers to track those conversations, but it’s not like there are no opportunities there.